Shirts With Random Triangles: Colorado adds three-star QB/safety prospect Carl Jones and three-star OT prospect Cam'Ron Johnson to its 2019 football recruiting class. Colorado adds three-star QB/safety prospect Carl Jones and three-star OT prospect Cam'Ron Johnson to its 2019 football recruiting class. Carl Jones. Image via 247Sports. Time for a Colorado footbsll recruiting update. The Buffaloes added its fourteenth and fifteenth members of its 2019 football recruiting class over the past couple of days. Bakersfield, California rising high school senior quarterback/safety Carl Jones announced his commitment to the Buffaloes on Wednesday. Then on Thursday, Pearland, Texas rising high school senior offensive tackle Cam’Ron Johnson announced his commitment to the Buffaloes. 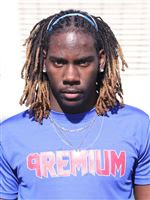 247Sports grades Jones as a composite three-star athlete prospect. The recruiting site’s composite prospect rankings for 2019 rank Jones at no. 165 among athlete prospects, at no. 183 among prospects from the state of California, and at no. 1826 nationally. Jones attends Bakersfield High School in Bakersfield, Ca. He stands 6’1, and weighs 195 lbs. Cam'Ron Johnson. Image via 247Sports. 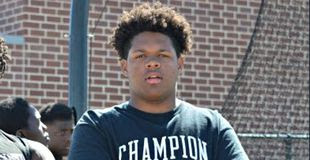 247Sports grades Johnson as a composite three-star offensive tackle prospect. The recruiting site’s composite prospect rankings for 2019 rank Johnson at no. 134 among OT prospects, at no. 214 among prospects from the state of Texas, and at no. 1593 nationally. Johnson attends Shadow Creek High School in Pearland, Tx. He stands 6’4, and weighs 283 lbs.